The data used in the research were from a variety of sources. Tree AGC was estimated using three tree above-ground biomass (AGB) geospatial data sets together with information on the fraction of dry biomass that is carbon. Forest fire data were from annual maps of fire severity from 2003-2012 produced by the Monitoring Trends in Burn Severity (MTBS) project. Bark beetle data were from annual maps depicting the areal extent of tree canopy mortality due to 12 bark beetle species produced from aerial surveys, forest inventory measurements, and high-resolution satellite imagery. There are 40 data files in GeoTIFF (.tif) format with this data set for the period 2003-2012. This includes 10 files of tree mortality from beetles and 10 files for the standard deviation, and 10 files for tree mortality due to fires and 10 files for the standard deviation. Figure 1. Cumulative tree mortality due to (a) fires and (b) bark beetles from 2003-2012 on forestland in the western United States. Tree mortality was quantified as the amount of aboveground carbon (AGC) stored in tree biomass killed by disturbance (e.g., Mg AGC ha-1) (Berner et al., 2017, in process). Tree mortality from fires and bark beetles was quantified from 2003-2012 across 802,575 km² of forestland located in the western US. Forestlands were included if consistently mapped as forest by three separate tree above-ground biomass (AGB) data sets. The analysis was conducted on a 1-km resolution grid in an Albers Equal Area projection, with the resolution chosen to match the bark beetle data set (Meddens et al., 2012). The data were from a variety of sources. Tree aboveground carbon (AGC) was estimated using three tree AGB geospatial data sets together with information on the fraction of dry biomass that is carbon. Forest fire data were from annual maps of fire severity from 2003-2012 produced by the Monitoring Trends in Burn Severity (MTBS) project (Eidenshink et al., 2007). Bark beetle data were from annual maps depicting the areal extent of tree canopy mortality due to 12 bark beetle species produced from aerial surveys, forest inventory measurements, and high-resolution satellite imagery (Meddens et al., 2012). Spatially explicit estimates of annual mortality from fire and beetles from 2003-2012 were developed and uncertainties were quantified using a Monte Carlo approach. Logan Berner was supported by the NASA Earth and Space Science Fellowship Program (Grant NNX14AN65H) and by the ARCS Foundation Scholar program. Beverly Law and Jeffrey Hicke were supported by the USDA National Institute of Food and Agriculture (Grant 2013-67003-20652). Arjan Meddens was supported by the Interior Northwest Climate Science Center (NW CSC) through a Cooperative Agreement (G14AP00177) from the United States Geological Survey (USGS). Temporal Coverage: The data cover the period 2003-01-01 to 2012-12-31. There are 40 files in GeoTIFF (.tif) format. This includes two files for each year from 2003-2012 for the two sources of tree mortality and the standards deviations; 10 files for tree mortality due to fires and the standard deviation for each of those files, and 10 files for tree mortality due to infestation of bark beetles and the standard deviation for each of those files. These data could be of value to climate models and policies and the impact of carbon losses due to forest disturbance. A Monte Carlo approach was used to quantify uncertainty in the estimates of annual tree mortality. 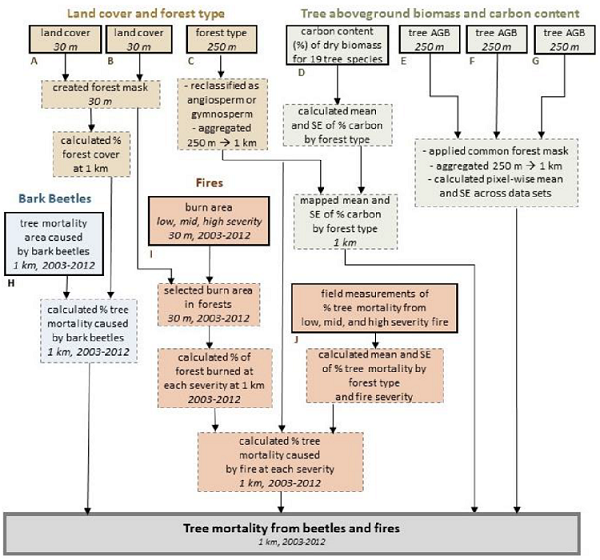 Annual tree mortality was simulated 100 times, where each iteration varied disturbance severity, tree aboveground biomass, and the fraction of dry biomass that is carbon based on uncertainty in each of these terms. The pixel-wise standard deviation (SD) was then computed across each annual set of iterations. The SD maps are included in the data set (Berner et al., 2017, in process). 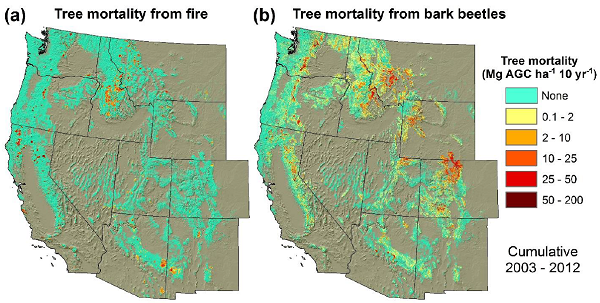 Tree mortality from fires (MORTfire, Mg AGC km-2) and bark beetles (MORTbeetle, Mg AGC km-2) was quantified from 2003-2012 across 802,575 km² of forest land located in the western US. Forest lands were included if consistently mapped as forest by three separate tree above-ground biomass (AGB) data sets. The analysis was conducted on a 1-km resolution grid in an Albers Equal Area projection, with the resolution chosen to match the bark beetle data set (Meddens et al., 2012). Tree AGC was estimated using three tree AGB geospatial data sets together with information on the fraction of dry biomass that is carbon (fcarbon): the Wilson et al. (2013) data set, which depicted tree AGB circa 2003-2008, and the Blackard et al. ( 2008) and Kellndorfer et al. (2012) data sets which represented tree AGB circa 2000. Pre-disturbance tree AGB in pixels were estimated that were disturbed during the six years in the Wilson et al. (2013) data set using the approach of Hicke et al. (2013) that involved comparing tree AGB in fire and beetles disturbed pixels against the average tree AGB of undisturbed pixels from the same forest type and ecoregion. If tree AGB in the disturbed pixel was less than the average tree AGB of undisturbed pixels, tree AGB in the disturbed pixel was set to this average, otherwise the disturbed pixel was unaltered. After implementing this correction, the average and standard error (SE) of tree AGB were computed for each pixel over the three data sets. Lastly, the average and SE of fcarbon for hardwood (angiosperm, 48.49±0.42% C, n=8) and softwood (gymnosperm, 50.87±0.63% C, n=11) tree species found in this region were estimated (Berner et al., 2017, in process). Forest fire data were from annual maps of fire severity from 2003-2012 produced by the Monitoring Trends in Burn Severity (MTBS) project (Eidenshink et al., 2007). These maps were derived from 30-m resolution Landsat images acquired before and after fires larger than ~405 ha in the western US. Fire severity was mapped using the differenced Normalized Burn Ratio (dNBR) and then each pixel was classified as one of five thematic severity classes. Pixels that burned at low-, moderate-, or high-severity were included and those that were unburned or showed post-fire greening were excluded. Two national land cover maps (Homer et al., 2007; Rollins, 2009) were used to generate a 30-m resolution forest mask to identify fires that were in forests. The annual fraction of forest area was computed that burned at each severity (As) in each 1-km pixel over the decade. In addition, field measurements of the fraction of tree biomass killed at each severity (ffire) were incorporated. The mean and SE of ffire were computed for forests dominated by hardwood and softwood tree species based on 116 estimates of ffire synthesized from 29 field studies (Ghimire et al., 2012) conducted in the western United States (Berner et al., 2017, in process). Bark beetle data were from annual maps depicting the areal extent of tree canopy mortality due to 12 bark beetle species produced from aerial surveys, forest inventory measurements, and high-resolution satellite imagery (Meddens et al., 2012). The USFS National Forest Health Monitoring program conducts aerial detection surveys (ADS) that provide a coarse snapshot of insect and other forest disturbance at a landscape scale (Johnson and Wittwer, 2008). Trained observers conduct surveys from fixed-wing aircraft that involve sketch-mapping the extent of areas affected by insect outbreaks and then visually estimating the number of dead trees within affected areas. Meddens et al. (2012) used the ADS observations to estimate annual canopy mortality area due to bark beetles across the western US from 1997-2010, with estimates then extended through 2012 (Hicke et al., 2015). Canopy mortality area was estimated at 1-km resolution based on the number of recently killed trees and the average canopy area of each tree species. The ADS observations underestimated the number of trees killed by bark beetles in comparison with field observations and QuickBird (2.4-m resolution) satellite imagery from Colorado, Idaho, and New Mexico. This led to the development of adjustment factors for several forest types based on the ratio of dead trees mapped from satellite to ADS tree kill counts. These adjustment factors were then used to modify ADS tree kill counts, resulting in high and middle (most realistic) estimates as well as low estimates based on unaltered ADS numbers (Meddens et al., 2012; Hicke et al., 2015). The data set includes bark beetle species that cumulatively killed at least 100,000 trees. Specifically, it includes (from greatest to least mortality area) mountain pine beetle (Dendroctonus ponderosae Hopkins), piñon ips (Ips confusus (LeConte)), Douglas-fir beetle (Dendroctonus pseudotsugae Hopkins), western balsam bark beetle (Dryocoetes confuses (Swaine)), and fir engraver (Scolytus ventralis LeConte), as well as seven additional beetle species that killed fewer trees. These data were masked to our domain and then summed canopy mortality area was summed across bark beetle species for each 1-km pixel in a given year (i.e., a voxel) from 2003-2012. Annual tree canopy mortality fraction (fbeetle) was calculated for each voxel by dividing canopy mortality area by forest cover fraction. The lower, middle, and upper estimates of fbeetle were incorporated into our analysis (Berner et al., 2017, in process). Spatially explicit estimates of annual mortality from fire and beetles from 2003-2012 were developed and uncertainties were quantified using a Monte Carlo approach. The Monte Carlo involved generating 100 realizations of annual tree mortality in each voxel, where each realization iteratively varied tree AGC, based on uncertainty in each term. Tree AGC within a pixel was assumed to change only due to disturbance (i.e., no tree growth or recruitment), which potentially caused a slight underestimation of tree mortality. For instance, stand age averaged 97±73 years (± 1SD) in the study area. Field measurements from the Western Cascades (Hudiburg et al., 2009) and the Rocky Mountains showed that tree AGC could increase 6-7% between stands that are 97 and 106 years old. This simplifying assumption made it so that cumulative tree mortality within a pixel could not exceed the initial tree AGC (Berner et al., 2017, in process). Figure 2. Workflow illustrating data sets (solid boxes) and processing steps (dashed boxes) for estimating tree mortality due to bark beetles and fires from 2003-2012 across the western United States (thick solid box). Data citations, spatial resolutions, and temporal ranges are shown where applicable. The mean and standard deviations (SD) were computed for the multiple estimates of tree mortality for each voxel, where the SD represented uncertainty due to parameter error (e.g., SEAGB, SEfire). Altogether, this process yielded spatially explicit estimates of annual tree mortality (and uncertainty). For additional details, refer to Berner et al. (2017). Homer, C., J. Dewitz, J. Fry, M. Coan, N. Hossain, C. Larson, N. Herold, A. McKerrow, J.N. VanDriel, and J. Wickham. 2007. Completion of the 2001 national land cover database for the conterminous United States - Representing a Decade of Land Cover Change Information. Photogrammetric Engineering and Remote Sensing 81(5), 346-354.